Finding the time to sit and write this has been a bit difficult as my whole world has changed quite a bit. At the same time I’m able to find comfort in the small things around me that stay the same—my sweet kitties lounging around the house or the way my house smells in the morning from my husband’s 100th cup of coffee, or even the way the light casts the same shadows on my walls throughout the day. My social life is limited mostly to what I view on my Facebook, Instagram, and Twitter, usually at 2 AM. I find it astounding and a bit humorous to see how in a twenty-four hour period my whole life unfolded a fascinating change and a beautiful story. I really am awestruck at the beauty of life and how incredibly faithful the Lord is to my heart. My story of Laef’s birth is super simple to so many. I think even to me it is simple. But simple is what I wanted. Simple is what I needed. Even in the simplicity, I love this story, because it is my journey. I’m telling this tale because I want to remember the details while it’s fresh in my mind. And whoever wants to read it is welcome to this small piece of my heart. It is one of my most cherished memories. It is the blooming of my heart and the new wind behind my sails. Wednesday, July 11th, Brandon and I went to my doctor’s appointment for a weekly checkup to see how the baby was doing. The weeks prior, Laef was facedown ready to come. The week before, I was dilated to 1 cm and 50% effaced. And on July 11th nothing had really changed, I was the same. 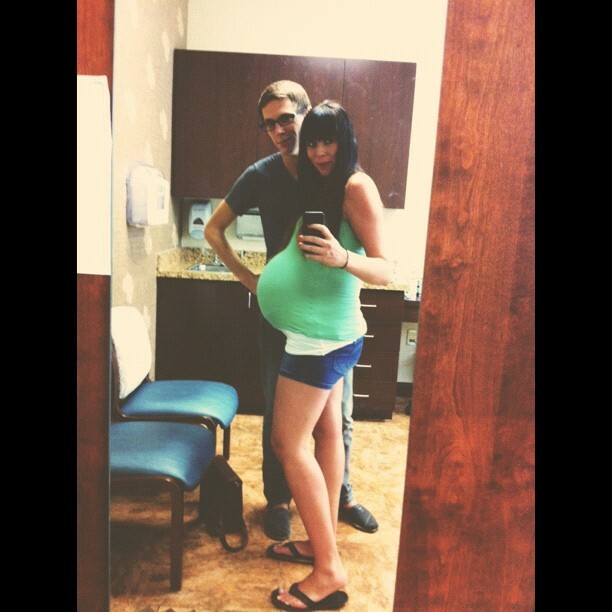 Brandon and I took a photo in the mirror of the doctor’s office, joking that it would be weeks before he would come. I was 39 weeks and 3 days that day. That evening as I lay in bed, my stomach was moving out of control. Laef was kicking so hard and my tummy was moving like waves. I felt in my heart that I should take in that moment. Looking at my stomach and thinking to myself that pregnancy was almost over and it would be a long time again before I felt a sweet baby moving around inside me. I breathed it all in and snapped a picture in my brain of that moment. Thursday, July 12th, I woke up at my normal nine AM and waddled down the steps of my house. I peeled some carrots and made some carrot juice with my juicer. I had one thing left on my list to check off before the baby came. (I needed to vacuum my downstairs really well.) I worked for about an hour and relaxed a bit on the couch before I decided to take a shower. I spoke with Brandon at work briefly and took the shower. I then ran the bath water to take a long bath. As I sat in my tub with my feet propped up on the wall, I watched my stomach move. Again, I felt like I should take in this moment. Here I am, Rebekah Fancher, 26 years old, married for 6 years, largely pregnant with her first baby, beautiful life, taking a hot bath...lol. You can call it sad if you want, but I didn’t talk to Laef much throughout this pregnancy. What to say? I didn’t know how to talk to him. So at times I would say “good morning” to him or talk to him a bit at night. “Laef, I have a wedding to shoot in September and I would really appreciate it if you could come earlier than later.” And then I said to him something I hadn’t really said too much of: “Laef, your dad and I love you so much and we can’t wait to meet you!” At that point, I became a sloppy wet mess of emotion, crying my eyes out and heaving heavily. (I’m tearing up again while I write this.) I then began to pray and talk to the Lord about my heart. I’m so thankful to know that He knows me inside and out. He knows all my fears and all of the unknown. He knows what makes me tick and what makes me move. He’s been so extremely faithful to my heart all my life. I sat on my windowsill for a second and let it pass. Well then I was hit with the (sorry if this is TMI for you all…but… it’s the story) “I have to go to the bathroom, now!” feeling. I sat down on the toilet and a massive gush of water came out. I thought to myself, “Was that my water breaking? No! Surely not!” And then it did it again, and another gush…and then another! I was sure of it! My water broke. But wait! I had hot boiling water on the stove! I ran in to turn it off. So I made my home on the toilet while I called Brandon. “Brandon, don’t freak out but my water just broke.” He was at work and about to get off in 30 minutes. He said a bit excitedly and franticly, “Ok! Alright! Wow!” He yelled out to his co-workers that my water broke and they all told him to hurry and get home to me! When I realized my water broke, a peace came over me. This really was going to happen! I was going to have a baby in less than 24 hours. Meanwhile, Brandon sat in a traffic jam for 45 minutes while we conference called my doctors/midwives and our parents. (My parents, who live in the Carolinas, were in Ohio visiting family.) My best friend, Sharon, and her husband jumped in the car and drove up from Jacksonville, FL. My parents also cut their trip short and left. When Brandon arrived we both packed up the little items we didn’t have already packed, loaded our car and went to Jason’s Deli for take out. After we arrived at the hospital at CMC Pineville at 8pm, it took about two hours to get me settled into my room. I wasn’t having painful contractions really, just very small ones that I hardly felt. The nurse and midwife recommended that I start walking the halls to get things moving along, so that’s what I did--two hours of walking with a few breaks here and there. I then labored for a while on a big exercise ball and walked a bit more. Finally around 3 AM, I asked for my *glorious* epidural. It took about an hour to get my body filled with the prerequisite liquids and for the epidural to kick in. Contractions were getting super rough by the time the medicine finally took effect. (I’m super bad with pain. I hate it… and I had no intention of trying to be a hero.) The epidural was fabulous. I lay in my bed for hours, not feeling anything waist down, and I was so happy about my decision, laughing and smiling along the way. I was dilated to 6 cm at this point and fully effaced. My best friend and her husband arrived around 4 AM and my parents arrived around 5 AM. Late morning came and my dear friend, Kori Hoffman, arrived to photograph everything. My brother, sister-in-law, and nephew arrived around 11. I believe it was around 2 PM that I was dilated to 9 cm and they wanted me to start pushing soon. They needed to get the baby out within 24 hours of my water breaking to minimize risk of infection and also because there was some light meconium in my amniotic fluid. At 2:40, we started to push. Baby and I were in it together. I never felt pain—just the feeling of intense pushing in my face. I did swell up like a beach ball. My feet looked like a blown up hospital glove. The hospital was super busy. My midwife had to step out and deliver twins, so they put me on hold for a good hour. Around 4:00 PM, we started again. The nurse tied knots in both ends of a sheet and had Brandon and I “play” tug of war to aid with my pushing. It was so intense. Seeing the look in my husband’s eyes as we pulled on this sheet, eye to eye, with all our might. My arms were aching. After 47 minutes of pushing and pulling (seemed much shorter) Laef arrived. They had to wash him off and everyone started crying immediately after they placed this sweet, chunky 8 lb 15 oz baby in my arms. Brandon and I cradled our sweet baby boy and wept together. I felt like I was in shock mode. Everyone was rushing around the bed and doctors and nurses were doing their jobs. I was stunned, so stunned. 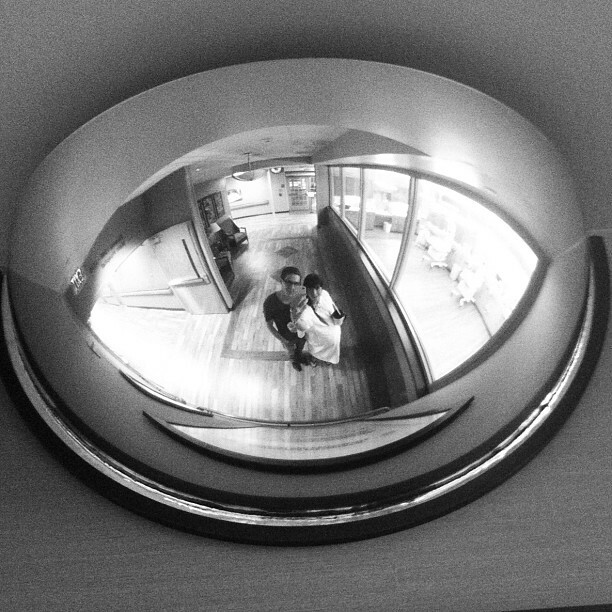 I held him skin to skin and grabbed a mirror so I could see his beautiful face better. Surrounded by my husband, my mom, my best friend, Sharon, my sister, Jessica, and my friend, Kori--crying eyes, happy faces, and a healthy (big) baby boy. The Lord is so faithful to me—so perfect in his ways. The hours after that were a bit rough on my body as everything was wearing off. Having to stand up after 16 hours of lying on that bed was exhausting. The next morning was so sweet. My husband held Laef skin to skin for a while. At one point, I looked over and Brandon had a sweet tear running down his face. I grabbed my camera and was able to catch one of the sweetest moments of my life. Brandon said “I love him…” I sat on the edge of my bed and wept. A few times during the next 48 hours I choked up at the sight of Brandon holding Laef with a proud, loving sparkle in his eyes. Brandon was mush, and I was mush watching Brandon be mush. This last week (Laef’s first) has gone quickly. Every day there has been a moment where I’ve held my perfect boy and cried over his beauty and the faithfulness of the Lord in my life. I feel like I’ve been handed this gift and I hope that I have and will be able to continue to take in the fullness of every moment with him. Even at 3 AM, I find myself exhausted and yet falling in love with my little man ever more. I’m overwhelmed at the preciousness of the moment. All the little things in life that I would obsess over seem so small and insignificant in the light of holding and enjoying the time I get with Laef. I understand so much more—I see so much more value in life. I grasp hold of the seconds and moments with him and let myself breathe in life’s gift. I’m getting to know Laef still, and I know that that journey of getting to know him will last all our lives. To end this little essay… my labor and delivery went great! I have no regrets, I have no ending trauma. I have a really great story to share and an overflowing love in my heart for this little dreamer. My parents were here all last week to help out with Laef. My mom is a hero. She takes care of Laef a few hours in the middle of the night and lets me and Brandon sleep longer stretches. She has been cooking and cleaning every morning, afternoon, and night. We are so thankful! I’m so happy that she and my dad have been around to enjoy his first weeks. My recovery has been somewhat easy, thankfully. Brandon will be working from home for a couple weeks. In a few weeks Brandon’s whole family will be coming out to visit. It will be a very busy August. Brandon and I are so excited about our life. Waking up together at 3 AM, yawning it out, feeding our little hungry dino, laughing about the craziness of our life, etc., we realize how happy we are that we decided to have a little person.